Building a frame for something meaningful. It’s sunny, 70 degrees, you have a beautiful view of calm, clear water. You see the occasional boater or paddle boarder. Yes, my friends you were envisioning this. Okay, maybe not exactly that. But something similar, am I right? Many people have their happy place, or a place they can call home (away from home). That home away from home holds a lot of memories. And this year, Bryn decided to build something to savor those memories. Last Fall, we brought home a large piece of paneling from the cottage (home away from home). To most people, this would have been something to toss in the trash. But we knew this would make a wonderful gift for family members to cherish forever. In order to give everyone a piece of this paneling, it needed to be cut into smaller pieces. Even though the pieces looked awesome, building a small frame for each one was the perfect touch. Cut the wood into strips for the frame. Create a rabbet in the strips for the paneling to sit on. Cut the strips of wood to length for the frame pieces. We cut ours all the same size, as we wanted a square frame. We used painter’s tape to put the frame pieces together while gluing them. 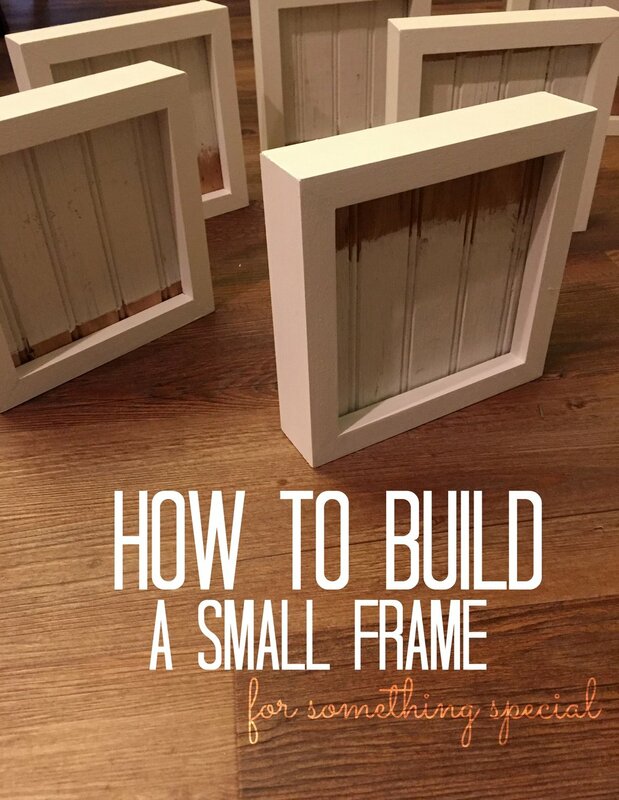 Click here to see an awesome video by Jon Peters on how to make a small frame. At 2:05 in the video is when he is gluing and nailing the pieces together. Put wood glue in between the frame pieces and connect them. You can use a nail gun to reinforce it if you’d like. Once the glue is dry, cut the paneling to size to fit the frame (using the table saw). Glue the paneling to the frame. Use hot glue on the back for reinforcement. What a wonderful keepsake for everyone to have! If you like it put a PIN on it!